“Life: that’s what I’m living. 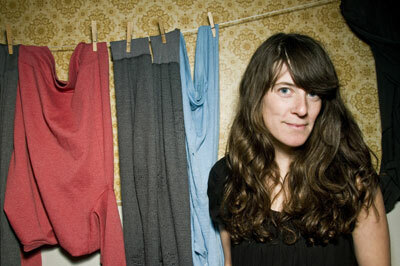 So I guess that’s what I know about best,” Julie Doiron says over the phone, reflecting on the realism that forms the bricks and mortar of her new record, I Can Imagine What You Did With Your Day. She’s lying on the back seat of her tour van and wondering why the dreamer within has never made an appearance in her music. For reality seems to have a much stronger grip on the East-Coast singer-songwriter’s lyrics than fantastical characters or wild stories. Her 2007 album Woke Myself Up, for example, is unembellished. Objective. And beautifully simple. Her songs are mirrors, reflecting life’s little moments (albeit the more dreary ones), such as blowing second chances and the stomach-wringing feeling of never living up to expectations. I Can Imagine What You Did With Your Day follows in the same bourgeois footsteps of Woke Myself Up. This time, however, the album has become a snapshot of a happier, spunkier Doiron. Which leads to the conclusion: Who needs to be a dreamer when you’re living the dream? I Can Imagine’s album opener Living the Life of Dreams nails Doiron’s sentiments about the people who adorn her life. Similarly, the lyrics on Heavy Snow and Nice to Come Home don’t stray far from what the titles suggest. And what keeps the happy-go-lucky smile permanently etched on Doiron’s face? Her children, of course, along with daily yoga and swimming dates. “It’s that simple,” she maintains. The ex-Eric’s Trip member has considered straying from the bread-and-butter of life to play make-believe with her lyrics, but she says that just isn’t her. It’s not an accurate way of communicating life’s underlying themes. In a nutshell, she says, a fiction-oriented Doiron isn’t what fans want. Instead, they prefer Doiron’s diary approach, which is something she learned when Woke Myself Up earned a nomination in 2007 for the Polaris award for Canada’s best album. “I prefer to sing in a simple style than to sing in a language I don’t use in my day-to-day life,” Doiron says. “I like the idea of using big vocabulary when speaking to people, but for my music, it doesn’t fit to make big stories with a lot of adjectives. “I try to do that but in the most basic, simple way. Like how Hemingway did simple sentences. I think that works better for me. This was written by Amanda Ash. Posted on Tuesday, June 16, 2009, at 1:48 PM. Filed under Projects. Tagged I Can Wonder What You Did With Your Day, Julie Doiron. Bookmark the permalink. Follow comments here with the RSS feed. Post a comment or leave a trackback.